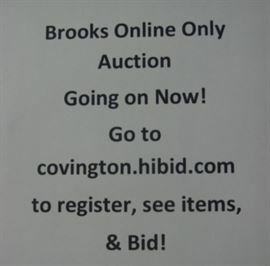 Online Only Auction - Go to covington.hibid.com to read all TERMS & CONDITIONS of this sale. You must go to this site in order to register & bid! Pick up date, & shipping information. Terms & Conditions before bidding! It's not to late to get in on the bidding action! Go to the website above & register to bid! THANKS! !